You have just been very privileged to have heard the last graduation address from the Duke of Devonshire as he retires as our Chancellor after ten years’ service to the University of Derby. Ten years and 66 ceremonies like this. Sixty-six addresses to over 25,000 individual students and their supporters, shaking most students by the hand to honour and celebrate their success. As our Chancellor you have always given your whole hearted commitment to the University, sharing your wisdom, knowledge and experience, with your passion for our students and staff always shining through. Graduation ceremonies are very special, as our Vice Chancellor so eloquently puts it, it marks a point in each student’s personal history, a day they will always remember. And this truly is a momentous day for many, made even more so by knowing that your genuine warmth and pride in their achievements will be so fondly remembered by each and every one of our graduates, their families and friends. Like all of us on this stage you firmly believe that the celebration of our students’ success is the single most important thing that we do. We ourselves celebrate 25 years as a University this year and the past ten with you at the helm has seen an extraordinary growth in our University. We have expanded from our Derby base to centres in Buxton, Chesterfield and Leek and I know you are particularly delighted that we now cover the whole of this great county of Derbyshire. Our student numbers have increased dramatically and we are now a University of choice for so many students. That reputation has been hard won and you have played no small part in getting us there. To many it might seem a privilege living at Chatsworth but imagine waking every morning to find another film crew outside your breakfast room window filming a Jane Austen novel. Seriously, Chatsworth is a very, very important business, the largest in the Derbyshire Dales employing over 700 people. Chatsworth makes a massive contribution to our local economy and it is the iconic tourist destination of our region, famed across the globe. Your untiring work in promoting this area with its associated tourism and business opportunities is second to none. After sitting beside you on stage for eight years at over 40 graduation ceremonies, I am sorry that I am unable to be with you in Derby today for your farewell celebrations. You have served the University in a quite exemplary manner for the last ten years and have shown real devotion and commitment to the role of Chancellor. The City and the County owe you an enormous debt of gratitude and as Lord Lieutenant I express sincere thanks and appreciation from everyone in Derbyshire for all you have achieved and contributed. Well done and every good wish. A heartfelt message from Willie Tucker expressing so well the feelings of us all here today. Our Chancellor, the Duke, is a connoisseur, his knowledge and passion for art is world renowned. He has, of course, a wonderful collection at Chatsworth but it’s a living collection expanded continually by the Duke, in particular supporting new and innovative artists, sculptors and craftspeople. He spotted Paul Cummin’s work at our degree shows and gave him the chance to exhibit his pottery at Chatsworth, from that exhibition Paul’s fame grew culminating in his extraordinary and stunning Ceramic Poppy Installation at the Tower of London. This subsequently toured the land and was recently at the Silk Mill here in Derby, another organisation so dear to the Duke’s heart. Your passion overflows into lecturing, your lecture at the University on the gardens and landscape of Chatsworth through the ages was both very entertaining and informative and had stunning feedback from our students and the public alike. You have always done all you could to develop even stronger links between the University and Chatsworth. This year for example our Institute of Quarrying centenary garden won three top awards at the inaugural RHS Chatsworth Flower Show. Your family has previous form as University Chancellors, amongst your forefathers were the Chancellors of London, of Manchester and of Cambridge, they never had the chance at Derby as remember our University is just 25 years old. I’m so very proud that we have been able to put that right over these past ten years. It was also a particular delight to award your late mother the Dowager Duchess an honorary degree at our first graduation ceremony in Buxton in 2006. Stoker, you will be sorely missed as our Chancellor but I know our relationship will remain, and from afar you will be keeping an eye on us and subtly offering those suggestions that really do make a difference. 83 Honorands have been welcomed into our University whilst you have been our Chancellor, I am delighted that number is now 84 by conferring upon you the highest award we can offer: the Honorary Degree of Doctor of the University for your outstanding contribution to the growth and development of the University of Derby and your lifelong devotion to Derbyshire and its people. 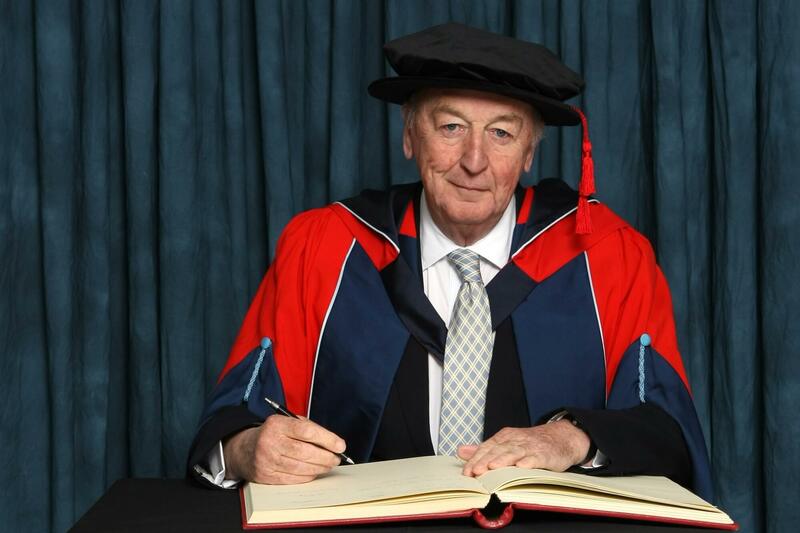 Chancellor, Lord Burlington, Pro Chancellor, Vice-Chancellor and distinguished guests, I am delighted to have been asked to present the commendation for Peregrine Cavendish, 12th Duke of Devonshire for the University’s award of Honorary Master of the Arts. Peregrine Cavendish was educated at Eton and Exeter College Oxford, where he received an Honours degree in Modern History. After Oxford he spent one year studying agriculture, and then went to work in the book publishing industry where he remained until his early thirties. He succeeded to the dukedom in 2004 and has largely been assisting in the management of the family estates Chatsworth in Derbyshire, Eastbourne in Sussex, Lismore in Ireland, and Bolton Abbey in North Yorkshire. His principal duty has been to preserve and enhance Chatsworth for future generations and the region benefits enormously from the running of that estate. Not least was that benefit realised, when he became the University’s third Chancellor and the institution has been immensely privileged and proud of the service he has given over the last ten years. During his tenure the Duke has done much to develop even stronger links between the University and Chatsworth, further strengthening its position in the region. He has been an invaluable friend and advocate for the University, facilitating many opportunities for students, which have added to the richness of their learning experience. He has taken great pleasure in presiding over the many Award Ceremonies throughout his term of office, seeing it as a privilege to share a small part in your students’ success. The University recognised this commitment by awarding him an Honorary Doctorate last year. This award is being given in recognition of the Duke’s service to the preservation of art, the enhancement of the Devonshire collection and his patronage and support of current artists. The Duke spotted the student Paul Cummins’ work at the University’s degree shows and offered him the opportunity to exhibit his ceramics at Chatsworth. From that exhibition Paul’s fame grew culminating in his extraordinary and stunning installation at the Tower of London titled Blood Swept Lands and Seas of Red. This subsequently toured the country and was also displayed at the Silk Mill in Derby. His interest in the arts overflows into lecturing. I understand that the lecture he gave at the University on the gardens and landscape of Chatsworth through the ages was both very entertaining and informative and had stunning feedback from students and the public alike. The estate was also the location for the inaugural RHS Chatsworth Flower Show last year. The Duke has a passion for collecting art that extends far beyond his custodianship of the historic Devonshire collections. There are many great houses in Britain that hold important collections of art and decorative objects, but most exist as museums of the past. Chatsworth could not be more different. In the tradition of many of his ancestors, The Duke has ensured that the Devonshire collection is a living one that is expanded continually through his support of new and innovative artists, sculptors and craftspeople. He recalls that everything was contemporary once. Many of these new works are displayed around the house and gardens, interspersed amongst the historical treasures, for the enjoyment of Chatsworth’s many visitors. It is an honour that my computer portrait of Lady Burlington has joined a collection that includes portraits by Reynolds, Sargent and Freud, and a testament to the Duke's courage as a contemporary collector. Nothing in my long career surprised me more than seeing this work in such an extraordinary context. The Duke is immensely well informed about contemporary art and design but he is unswayed by passing fashion. Like all true collectors he combines knowledge, taste, and the confidence in his own eye and instincts to follow his personal passions. The Duke is not just a collector but a patron, a champion of art. He does not simply collect, he commissions new work from artists both celebrated and unknown. As an artist I have been fortunate personally as a beneficiary of the Duke's confidence and support, but also of his warm and generous friendship. The Duke is Deputy Chairman of Sotheby’s, the Patron of the Derby Museums Trust and President of the Arkwright Society. In April 2016 the Duke was made an Honorary Fellow of the Royal Academy. In recognition of his lifelong interest in the creative arts and his commitment to promoting new and established artists I am delighted to commend Peregrine Cavendish for the honorary degree of Master of the Arts.